Every year, as the weather turns cold, my husband starts closing down the windows of the chicken coop. 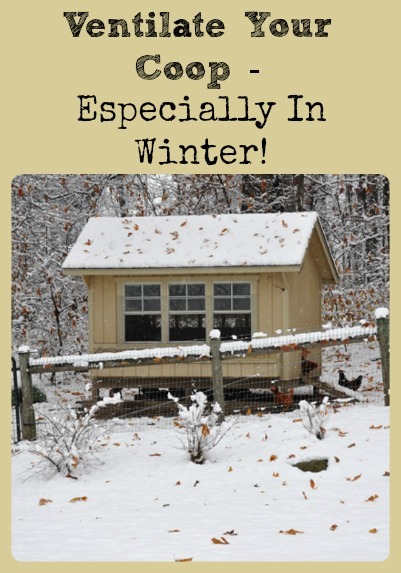 He means well, but every year I explain why it’s very important to keep the chicken coop well ventilated, and why it’s even more important in cold weather (notice the windows are wide open – front and back). Chickens generate a lot of moisture, ammonia, and heat – so it’s absolutely critical to ventilate well to remove the excess from the coop. The more time your chickens spend indoors, the more important it is to supply good ventilation. Chickens generate lots of water vapor, from both their breath and droppings, and all this water vapor tends to make coop air humid. High humidity (particularly in cold weather) makes chickens more susceptible to respiratory illness and frostbite. Good ventilation will remove this dampness and humidity from the coop, and chickens can withstand surprisingly cold temperatures without getting frostbite – if the air is dry. Chicken also cause lots of ammonia fumes to be released into the coop from their droppings. Ammonia fumes can cause damage to the chicken’s respiratory tract at surprisingly low levels, and again, make the chickens more susceptible to respiratory illness. Basically, if you can smell ammonia near the coop floor, there’s enough to be harmful, so you need good ventilation to remove those ammonia fumes from the coop. Good ventilation is also necessary to remove heat from the coop during warmer weather. Chickens do best in temperatures below 75°F and really start to suffer above 90°F, so ventilation is needed to keep the coop at least as cool as the outside air. Good ventilation also supplies oxygen-laden fresh air that the chickens need, removes dust particles suspended in air from the coop (ever notice how dusty chickens are? ), and dilutes any disease-causing organisms in the air. Chickens produce water vapor, ammonia, and heat continuously; so the chicken coop needs to be ventilated all the time – day and night, summer through winter. If a storm is causing torrents of rain, then it’s ok to shut down some of the ventilation for a little while – otherwise the coop should always be well ventilated. In areas where very hot weather’s not a problem, one square foot of vent opening per ten square feet of floor space is generally advised. In hot weather areas, it’s often recommended that entire sides of the coop be constructed so that they can be removed (and replaced with hardwire) to maintain sufficient ventilation. If your climate is very wet or your coop is crowded, more than the recommended amount will also be needed. However the ventilation is supplied, make sure all openings are securely covered with something like hardware screen that predators can’t get through or get to your chickens through. In cold weather, make sure that the ventilation isn’t causing drafts – any ventilation that will be used during cold weather should be high up and hopefully protected from rain and snow by roof overhangs. You don’t want a cold draft wafting across your chicken roost(s) at night. In warm weather, vents that provide a breeze for the chickens are good so openings lower in the coop are desirable. Obviously, the amount and location of ventilation needed changes as weather conditions change, so it’s important to have many ventilation options that can be opened or closed as necessary. Consider your coop ventilation requirements carefully, and plan for more, not less. And, don’t shut off all the ventilation in winter – chickens need it then too! We’re new to chickens, so just starting out. We live in North-Central Ohio – not ARCTIC cold or Texas hot, but we have a wide range of temps throughout the year (well below 0- low 90’s). We’re looking at building the coop inside an existing pole shed, using 2 of the walls of the shed as 2 of the walls of the coop- meaning we’d just have to build the floor, 2 walls and a roof. The shed is completely open on one side (we’d have plenty of ventilation built on that open side) , but dh is loathe to cut holes in in the barn siding to allow a cross breeze. If I ventilate only on the 2 walls we build (they’ll be perpendicular to each other) would that be enough? Should I cut holes in the roof? (The roof of the shed will still be there to protect from weather). Am I overt thinking this? Thanks! I live in North Iowa – temps dip to 30 below zero. My windows will remain closed, thank you. Very informative. Thanks for posting this. 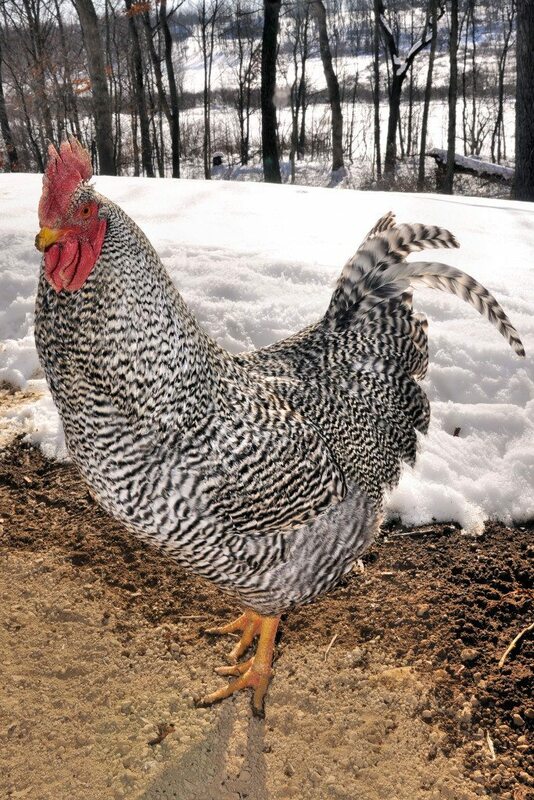 We intend to add a small chicken flock in the spring and I will save this post to use in the late fall. Thanks for this great information. I only have three girls and they don’t spend a lot of time inside except when it is real windy and below freezing. They have a lot of space in a 16 x 10 space but I might want to open those upper high vents when they are in all day when it’s so cold. Oh I wish I could I could keep the windows and/or doors open at -50 degrees! Plenty of ventilation is allowed until around 0 degrees in the dry, not too windy Alaskan interior. -20 is where things start getting tricky and -30 a small heat source is needed and a light on a timer because of all the darkness. Granted, most of the people in the US don’t have to deal with such extremes. In Wyoming it certainly drops 30 below AND white out snow blowing is a gentle breeze. My chickens had chicken wire at the top of the coop & the door was made up of chicken wire & wood frame. Snow blew in one side a few times. They actually didn’t seem fazed! I bedded everything deep & fluffed the bedding a few times. Didn’t loose one bird, & they all seemed fine. I won’t be using a lamp, & won’t be leaving the coop window on the new shed (old one was just too small after we got over 30 birds this summer) when the snow blows. However, the window will be open when it’s decent out. I am making one adjustment…I won’t be walking buckets out to fill water several times per day when it freezes so quickly. I got a heated waterer!! Congratulations on that heated waterer, it really helps out in winter! So, I have a tiny coop, approximately 3 for by 3 ft and about 4.5 foot tall at the top of the a-framed roof(house shaped) the doorway is centered on the bottom (about 18t X12w inches) the only other opening is across the back about half way up a hinged trap door to gather eggs from the two nesting boxes. The roost is a few inches higher than the nesting boxes, any suggestions for ventilating? It has a small run attached to the front that is 4 ft tall, 3 foot wide and 6 foot long. with clear vinyl on the northside to block the Oklahoma winter wind. We were just given a 10’x10′ wooden shed with a small window and a sliding glass door. The previous owner kept poultry in there. We only have 8 chickens. There are no vents and it has been in around 20•F The she’d is along the west side of a tree line with flat crop lands south and north of us so it gets windy! I have been leaving the window and door open 1″ while they are in it. They haven’t wanted to come out since it snowed (normally free range). How much should I open them? No frost on the inside windows. I use hardwood shavings. The heated water and food are inside. Thanks! Do you close the windows at night though? What about on really windy days? Hi Jess, no we do not close the windows at night, we are trying to keep the humid air moving out, because they really do much better in dry, cold air. I guess on a really windy day when it’s torrentially raining, we consider closing the windows. Great article! Well written and easy to understand. Living in Alaska, we get these questions all the time. Granted, at first glance it does seem counter intuitive, but you explain it very well. Thank you! I have this coop: http://www.tractorsupply.com/en/store/precision-pet-products-chicken-coop-retractable-wheel-kit. I have plastic wrapped around the open areas with small spaces at the top of the hardware cloth. I am not sure how to “vent” the little house area…should I drill some small holes at the very top underneath the roof overhang? My two girls sit on a roost in there, so it would be up above their heads. The front faces north and the tall side (hardware cloth) faces west. Both are protected. I keep the tray under their roost clean every day…just worry they still aren’t getting enough vent, but don’t want to cause a draft. Please advise! Thanks! I have not been able to get a straight answer from anyone on EXACTLY what I should do with this small coop! Help! Hi Carrie, so those are not real windows in the little house area? If not, I think it would be a very good idea to drill holes to vent. It’s good to keep the air moving above their heads in winter, and we our chickens just go out into the pasture – no plastic wrapping needed. Great post. Your coop is really cute too! Hi Lisa, I’d never considered my coop to be “cute” – I’m seeing it in a whole new way. Thanks! Not cutesy…just cute. Or maybe its just my snow envy talking! That coop is seriously adorable! Great info – thanks! I don’t understand how to ventalate and not have a draft. I have 3 windows in my coop. Two are high and one is low. Should I leave one open, and which one? Hi Debbie, if you are in cold weather, then you don’t want the ventilation to be drafting cold air across the chickens as they roost, eat, etc. but you do want it moving the air out of the coop. I’m not familiar with your coop, but I would probably leave the both of the ones that are high open during cold weather. In warm weather, I’d probably open them all (provided they are adequately covered so that predators can’t get in). Again, I don’t know what your coop looks like, so you’ll need to decide if that makes sense. Thanks Lesa! Yes I am in cold weather in Ohio. I was told to cover my windows with plexiglass in the winter. Otherwise they are open all the time. (covered with a screen). I open the door to their pen during the day but they will not come out. Sometimes they are in their boxes all day. I only have three chickens (Golden Buff) so I am always worried they are going to freeze. Thanks again for your help.